Our Specialties - Glenn's Bakery. Glenn’s has the best burger in town, and great chili cheese fries to go with it. From Monday through Friday, our lunch specials offer favorite sandwich combos. We have light and nutritious salads, and the Green Chile Stew is a Gallup classic. You can also build your own sub or sandwich with an assortment of deli meats and cheeses. We also have a very convenient drive-thru window. Call ahead and pick up your order, or simply drive up when you’re in a hurry. Did we mention we have The Fastest Breakfast in Town? Served with potato chips unless you order a different side. 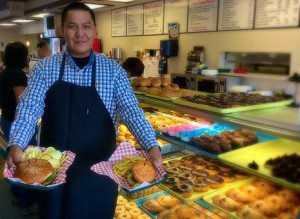 All specials include a choice of French Fries, Pasta Salad, Potato Salad or Green Salad, a 32-oz soft drink and 2 donuts. Please call for Daily Specials, Evie is always changing things up and making fresh stuff! Green Chile Stew (16 oz.) — a popular choice! Meats: Ham, Turkey, Roast Beef. All subs can be toasted or grilled. Served with your choice of Italian, Ranch, or Thousand Island Dressing.